After what she called a challenging campaign, Heather Repenning — an L.A. Unified parent and former mayoral aide — is “optimistic” she will defeat frontrunner Jackie Goldberg in the May runoff for the District 5 school board seat. The Los Angeles County Clerk on Friday certified the results of the primary election, which put Repenning in second place out of 10 candidates. She squeaked into the runoff by 31 votes, over Huntington Park Councilwoman Graciela Ortíz. Repenning had 13 percent of the votes, while Goldberg, a former District 5 board member and a longtime politician, captured 48 percent. While Ortíz could have called for a recount, Repenning has been effectively campaigning against Goldberg since March 15 when Repenning declared she would make the runoff. But on Wednesday, Ortíz told LA School Report that she will not request a recount. The winner of the May 14 runoff will become the seventh member of the board, where power currently swings between board members elected with the support of education reformers and charter school backers and those elected with teachers union money and muscle. Repenning, 44, vows to be a “coalition builder” on the board, where she says there’s an “ongoing battle” for control. She reiterated to LA School Report on Friday that she won’t take contributions from charter school operators. 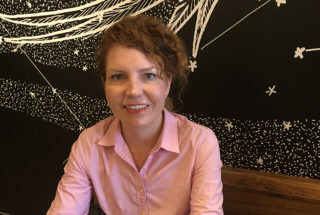 In an hour-long interview earlier this month in a coffee shop in Silver Lake near her home and in follow-up conversations and emails, Repenning outlined her qualifications for the job and her priorities for the district. If Repenning wins, she would be the only board member with a child in the school district. Her daughter is in second grade at Ivanhoe Elementary, their neighborhood school in Silver Lake, in the northern section of District 5. The district, known as BD5, includes wealthier and whiter communities north of downtown as well as predominantly poor and Latino areas of southeast L.A.
Repenning, who is divorced, has lived in the neighborhood since she moved to Southern California in 2001 for graduate school. She was born in Kentucky and moved to Florida at age 10. She learned the importance of public education through her mother, who taught second grade in a Cincinnati school — across the state line from Kentucky — where the majority of students were African-American. “She was always very focused on my education,” Repenning said of her mother, a single mom. Repenning attended public schools, including a magnet school in Florida for middle and high school. “I was very lucky I had a world-class education.” In her magnet school, “We all went to college, there was no question about it, and that’s what I want for my daughter and for all LAUSD students.” She graduated from Swarthmore College with a degree in literature and has a master’s degree in comparative literature from the University of California Irvine. Before beginning her career in the public sector, she taught at L.A. City College and at a bilingual school in Honduras. She speaks Spanish and French. Repenning has spent nearly two decades with the City of Los Angeles, working closely with Mayor Eric Garcetti in various roles including as political director on his 2013 campaign, director of external affairs and vice president of the Board of Public Works, which she resigned from when she announced her candidacy last year. She also worked with L.A. Unified helping organize parents and other stakeholders around the building of new schools, including those at the Robert F. Kennedy Community Schools site. And while we’re talking, I’m a *life long* progressive and public servant with two decades of relevant experience to the LAUSD Board of Education. I’m also an LAUSD mom. So yes, I care deeply about public education for all. Thx. During the primary campaign, Repenning’s top supporters were the mayor and the education workers’ union. SEIU Local 99 represents 30,000 custodians, cafeteria workers, special education assistants, bus drivers and other school workers at L.A. Unified — about the same number of members in the teachers union, United Teachers Los Angeles, which backs Goldberg. Nearly half of SEIU Local 99 members are also parents or guardians of school-aged children. SEIU Local 99 has spent nearly $1 million to support Repenning so far. In the primary, Repenning was the strongest fundraiser, with $286,745 in direct campaign contributions. On the day of the primary election, philanthropist Eli Broad made a $100,000 donation to an SEIU Local 99 political action committee backing Repenning, the Los Angeles Times reported. Broad’s foundation has funded reform-minded board candidates and supports charter schools. She has positioned herself as a centrist candidate — pursuing neither charter backers’ nor teachers unions’ support. UTLA pushed for Goldberg to be appointed to the BD5 seat last August after it was left open when Ref Rodríguez resigned after pleading guilty to political money laundering charges. The board rejected the proposal to appoint Goldberg, which was introduced by board member Scott Schmerelson in August, after pressure from the community, particularly Latino parents from the southeast section of BD5. Repenning’s endorsements also include the United Firefighters of Los Angeles City Local 112 and at least a dozen other local unions, as well as the National Women’s Political Caucus LA Metro, the Los Angeles County Young Democrats and local and state elected officials. On Wednesday, she picked up the endorsement of the Los Angeles School Police Association, which had backed Ortíz in the primary. Also Wednesday, Eduardo Cisneros, director of the National Census Program for NALEO Educational Fund and a former field director for Yolie Flores when she was an L.A. Unified school board member, announced his endorsement for Repenning through his Twitter account. Cisneros was also one of the 17 initial candidates in the BD5 race, but he withdrew in November. Former BD5 candidate Justine Gonzalez also endorsed Repenning. Repenning says she looks at basic priorities that the district needs to address “now” from a parent perspective. The BD5 board member represents more than 81,000 students enrolled in 177 traditional schools, as well as nearly 15,500 charter school students, according to the California Charter Schools Association. Those students attend 32 independent charter schools. Because some of those schools are on multiple campuses, that brings the number of charter sites in BD5 to 41, a district spokesperson said. Other school choice programs in BD5 that are run by the district include 38 magnet programs and 32 dual language programs. There are no affiliated charters — which are district-run schools with some autonomies — in BD5. While Repenning has not been as direct a critic of charter schools as Goldberg has been during the primary campaign, Repenning said she “would have supported the resolution” that the school board approved in January calling for a moratorium on new charters. Goldberg also said she supported the moratorium. “The resolution itself is symbolic. The school board doesn’t have a lot of oversight. All of the rules are set by the state, so the district currently doesn’t have the ability to put a moratorium on charter schools. They can ask the state to look at it, which they did,” Repenning said. District 5 has the second-highest concentration of Latino students in L.A. Unified. Latinos make up almost 90 percent of enrollment in L.A. Unified’s Board District 5, which has some of the district’s neediest students and the state’s lowest-performing schools, particularly in the southeast section of the district, where many students are children of immigrants. In the last 24 years, only two Latinos have occupied the BD5 board seat: Rodríguez, who was elected in 2015 and served as president of the board before resigning last year, and Yolie Flores in 2007. Flores was vice president of the board for three years of her four-year term. “I’ve lived in Board District 5 for 18 years, pretty much since I first moved to L.A. I understand the importance of representation,” Repenning said. “While I am who I am, I can represent the things they most care about and that students need. “It’s very, very important for me to speak Spanish. I think is very important that we support those kids who come to our schools speaking Spanish and not override their Spanish but preserve it, so they can actually come into kindergarten (being) bilingual. Goldberg has the support of prominent Latino political figures such as L.A. County Supervisor and former U.S. Secretary of Labor Hilda Solís and iconic Latina activist Dolores Huerta. Repenning was endorsed by the Latino Coalition of Los Angeles, an organization that advocates for policies and legislation that benefit the Latino community in Los Angeles. Toruno said that as a first-generation Latino and graduate student at UCLA, “I understand the importance of Latinos having access to high-quality early education and college readiness, and she (Repenning) has really addressed that as a priority in her vision.” He also said Repenning showed that she cares for the social-emotional needs of students and recognized how poverty affects their learning. Independent studies of L.A. Unified’s finances and budget reviews by the district’s county overseers have pointed to significant deficit spending and ballooning health care and pension costs that will eat up the district’s reserves within three years. The district’s budget relies on new funding sources that are not guaranteed: projected revenue from Gov. Gavin Newsom’s proposed budget and local initiatives like a parcel tax, which will be on the ballot this June. The county could even take control of the district’s finances if officials are not satisfied with its updated fiscal stabilization plan presented last week and its ability to maintain reserve levels. Goldberg and the teachers union have questioned the district’s and county’s assessments of L.A. Unified’s financial stability. But Repenning affirmed “there are some really big challenges on the horizon,” adding that “it serves no one to turn a blind eye to the very real financial issues LAUSD is facing. First, we need more support for our schools from both Washington and Sacramento and for all of us to put aside political differences to ensure we pass Measure EE this June,” she said, referring to the proposed parcel tax. “I do think that there are areas inside the bureaucracy where we can look to push out resources to the school sites. I’d love to create a program where everyone at Beaudry or at the local districts spends one day a month or maybe more working at a school site. Because a school site is at the core of what we’re doing, that’s where our focus should be. That vision includes not just students in District 5 but all district students, she said. *This article was updated Wednesday to add the endorsements of the Los Angeles School Police Association and former BD5 candidates Eduardo Cisneros and Justine Gonzalez, and to add that Ortíz will not request a recount.